Although there is no town of Bakshaish in the Heriz weaving area, the term has been applied to those antique rugs & carpets from the later 19th century with generally allover patterns, mellow colors and semi-geometric drawing. 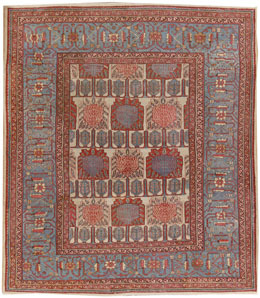 The genre transitioned into the characteristic Heriz style by about 1900 and most real Bakshaish carpets are truly antique. 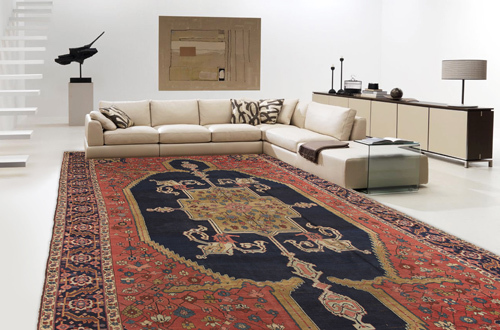 The often-soft tonalities in the rugs make them ever popular in decorative circles and they have never gone out of fashion. The color schemes tend to be slightly softened by age and the dyes are from natural sources. See Heriz entry for further illustrations.